When I read this article by William Thomas, “What is Old Age For?’ I immediately went back to 1980 and my move to Galveston. In addition to the miracle of landing a job after graduate school, I was also asked, through friends, to house sit for someone who was going to live in Mexico. It was an 1857 carriage house next to the Sealy Hutchings Mansion – complete with a turret, 2-foot limestone walls and character in every inch. Though I didn’t know it at the time, I had landed in a dream home. And then there were the estate’s gardeners – three ancient Black men, all in their 70’s, throw backs to a much earlier time, each with their own unique way of dealing with the world. I would venture downstairs to where they hung out, and I would listen… and learn. John, the self-appointed boss – big, burly with the all-day unlit cigar and cap, spewing out lines of wisdom like it was cotton candy. He’d say, “Tony, I don’t know, I’m just not pullin’ the cart today,” as he would moan and groan about having to maybe rake some leaves. As Richard, with the toothless, eternal grin, would roll his eyes at poor John’s fate of having to “work.” Richard was actually the worker, but like Tom Sawyer, John had a way of making it seem he really did most of the work and was why the grounds always looked so good. Richard would just chuckle at John, shake his head, and move off to get the leaves done. And then there was Maurice. He was really a master gardener – the only one of the three who actually knew anything about gardening. He maintained, not just the most incredible rose garden you ever saw, but a huge number of orchids in the large greenhouse that sat next to the carriage house. I ended up staying there for 4 years and finally left to get married and move to the concrete jungles of South Houston. Still I was working in Galveston and would stop by to see my gardener friends and life teachers whenever I could. Over time, one by one, they would not be there, as I would find out Richard passed away and Maurice just left when it stopped being fun. 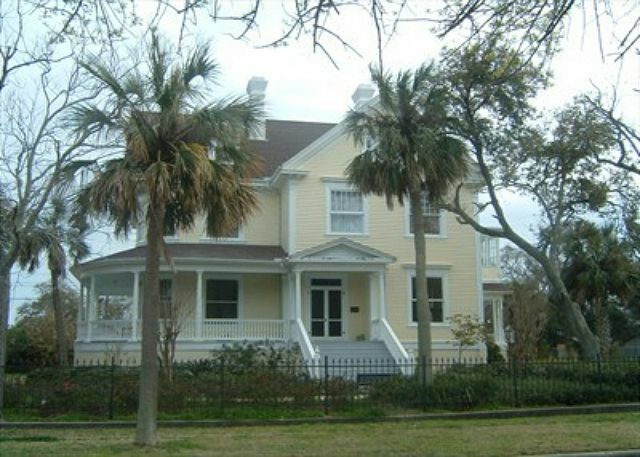 With a family of two little ones, we decided to move back to Galveston, bought an old Galveston house built in 1875, and renovated it to hopefully make it a proud member of the other stately ones on the block. But I never, ever forgot the life shaping moments of the carriage house and my three old life mentors. Around 1994, while reading the paper, I saw John’s picture in the obituaries. Funny not seeing him with a 5-day old cigar and cap. Yes, there was a tear or two falling on his picture, but that wasn’t so much because he had died. I think it was because I knew there were only memories left of that time. Would I keep anything I had learned from them? Would the world help me make it all fade away? Maybe not? Maybe I can think back to old friends, help my kids understand the value and meaning of growing old, holding on to the things that have value, especially when you don’t realize it at the time. So here’s to aging and to John, Richard, and Maurice. They live forever, at least in the mind of a kid from New York City. Thomas, W. What Is Old Age For? Yes Magazine, 2005. Adapted from: What Are Old People For? How Elders Will Save the World, by William H. Thomas, M.D., copyright 2004.